Water is our most precious resource. While humans can live many weeks without food, we cannot last more than a few days without fresh water. In the United States and most of the Western world, we take the availability of water at the faucet, any time day or night, for granted. The process for getting the water there, however, is more involved than you may think. Our water story starts at the head waters of Reems Creek, located in the Beech community of Buncombe County. Here, the District owns the entire Sugar Camp Fork and Laurel Fork watersheds (to learn more about watersheds, click here). This land adjoins the Pisgah National Forest, Blue Ridge Parkway, and Asheville watershed. Precipitation over the mountains falls into this watershed and is carried by creeks to a 5 acre manmade reservoir built by the District in 1962. The reservoir is nearly 60 feet at its deepest point, and is held in place by an earthen dam. From here, water flows by gravity into the District’s treatment plant, which was constructed in 1995. 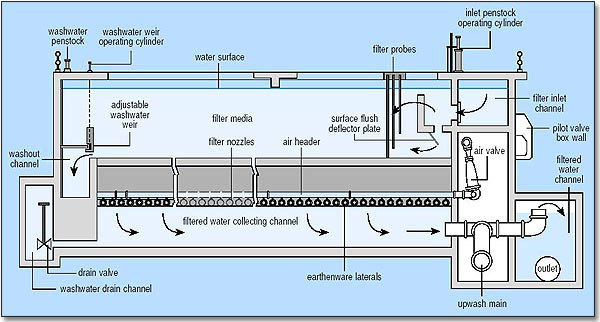 Water enters the treatment plant and is treated with chlorine prior to entering the first stage of filtration, called flocculation. The purpose of flocculation is to get small, invisible or semi-invisible particles to stick together so that they can be filtered out of the water easier. The next stage of filtration allows the water to flow through a combined charcoal-sand-gravel bed to remove any remaining particles as well as microscopic organisms. This water is then lightly treated with chlorine to maintain its cleanliness and pumped to a storage tank called a clear well, where the chlorine is allowed to contact the water long enough to ensure all bacteria has been eliminated. From here, water flows through over ten miles of pipe before it gets to the District’s distribution system, where a series of pipes deliver this treated water through a water meter and into your home. In addition to providing the treated water, during this time the District also continually tests the water for safety, provides sufficient water pressure and flow to fire hydrants for fire fighting capabilities, checks meters for consumption, provides billing services, repairs leaks in water lines, and conducts many other operations to ensure that clean, safe water is always available at your faucet, any time day or night.